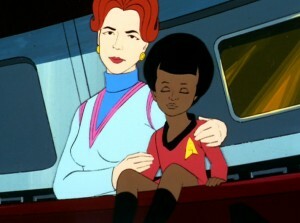 This episode features Spock as a tiny little Vulcan boy, dealing with all the crap kids still deal with today. It's a bittersweet, surprising story with a lot of heart. Stand Out Line: What a trip, Bones! Cyrano Jones (the character and the actor) is back! This time he's brought new, genetically altered Tribbles which have become the bane of the Klingon Empire. Stand Out Line: We must have the glommer! Kirk and Spock are beamed down to a crazy asteroid to search for a long-lost religious artifact with a bunch of other guys. It's a big, fun romp. I really like it. Stand Out Line: We'll all die here! For a 24 minute episode, this one is surprisingly complex. 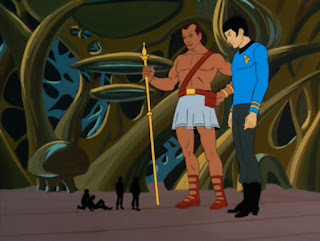 It involves an ancient race, a sought after weapon, and a story that revolves (uncommonly) around Spock, Uhura, and Sulu. The episode also tackles some fairly complicated issues which, again, is a pretty big achievement. Stand Out Line: The Kzinti have legends of weapons haunted by their owners. Watch this episode because Bem (a longtime SciFi term for Bug-Eyed Monster) is an awesome character. David Gerrold (writer of Trouble With Tribbles) does another great job with this one. Bem is just the kind of episode that Star Trek couldn't do with live action but it's perfect in cartoon form. Stand Out Line: How come we always end up like this? "The Infinite Vulcan" features a Eugenics Wars story (which I always enjoy) and GIANT SPOCK. "The Counter-Clock Incident" is all about the crew of the Enterprise getting pulled into a "negative universe" wherein everything ages backwards--including them. Watch this one to get a taste of the awkward teenage years of Kirk, Uhura, and Scotty. I agree with your pics except for BEM. I would replace it with The Time Trap. Just found this blog the other day and am enjoying it.